Flame detectors have evolved with respect to their functionalities and accuracy of detection, from single IR /single UV which detect UV and IR radiations emitted from a flame, but are susceptible towards false alarms when a detector is covered by dense smoke or grease, to more advanced flame detector technologies such as dual IR/ UV, IR3, and & multi IR which identify false alarms and have a long detection range. Different detectors such as single UV, single IR, dual UV/IR, IR3 and multi IR are used currently; they cater to many application areas across diverse industries such as manufacturing, oil & gas, energy & power, and mining. The other emerging industries in which flame detectors are being used and are gradually gaining importance are printing and paper. The global flame detectors market is expected to grow at a CAGR of 6.07% between 2015 and 2020, and reach USD 3.2 Billion by 2020. This report on flame detectors analyzes the flame detectors market value chain and provides a clear insight into the major and supporting segments of the said market. The market has been segmented on the basis of product, service, industry, and geography to come up with market size estimations till 2020. This report also analyzes the market trends pertaining to flame detectors. It identifies drivers, restraints, opportunities and challenges, and the current trends related to the global market. Apart from the market segmentation, the report also includes qualitative analyses such as Porter’s five forces analysis and value chain analysis. The flame detectors market report profiles some of the key technological developments in recent times which are driving the adoption of flame detector technologies. It also profiles some of the leading players in these markets and analyzes their key strategies. The competitive landscape section of the report provides a clear insight into the market share analysis of the key players. This figure shows the various aspects covered in this research study on the flame detectors market. Three major aspects of the total market are covered in this report, namely, market analysis, market classification, and market landscape. Some of the major manufacturers of flame detectors are Honeywell International (U.S.), Siemens AG (Germany), Johnson Controls (U.S.), General Monitors (U.S.), Det-tronics (U.S.), Micropack (U.K.), Emerson Electric Co. (U.S.), Spectrex, Inc. (U.S.), Simtronics ASA (Norway), United Technologies Corporation (U.S.), Robert Bosch GmbH (Germany), and Tyco (Ireland) among others. The global flame detectors market has been segmented on the basis of products into single IR, single UV, dual UV/IR, triple IR (IR3) and multi IR. 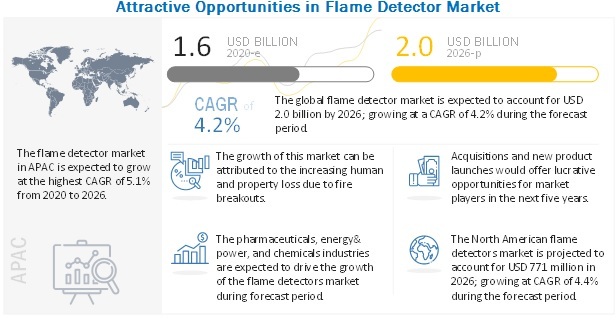 The global flame detectors market has been segmented on the basis of services into maintenance, engineering, inspection & managed and installation, design services and other services. Other services covers tenancy & refurbishment upgrade services. The market is segmented on the basis of industries into oil & gas, marine, transportation & logistics, mining, manufacturing, energy & power, consumer goods & retails, government, nat gas/ lng, automotive, aerospace & defense, healthcare, and others. Other industries majorly include paper and printing. 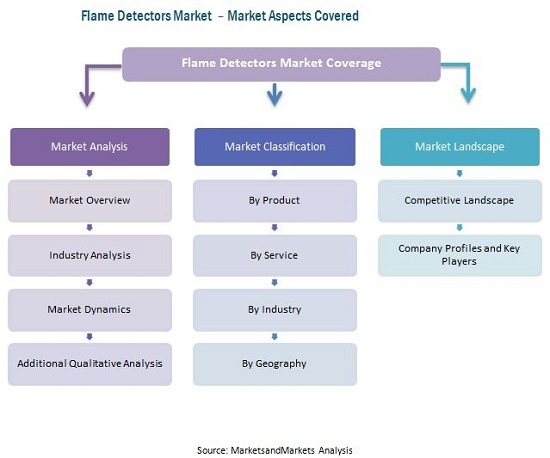 The report segments the flame detectors market in four major geographical regions, namely, North America, Europe, Asia–Pacific, and Rest of the World (RoW). North America has been further segmented into the U.S, Canada, and others; Europe has been segmented into the U.K., Germany, France, Italy and others; APAC comprises China, Japan, South Korea, Australia, and others, and RoW comprises South America, and the Middle East & Africa. Flame detectors are considered to be a breakthrough innovation in the field of electronics and fire protection systems. The innovation has led to the development of various detector devices which have the property of detecting different kinds of radiations that are emitted by flames. The global flame detectors market is expected to grow at a CAGR of 6.07% between 2015 and 2020, and reach USD 3.2 Billion by 2020. Flame detectors are devices which have the property to sense radiations coming out flames. These flame detectors work by detecting the intensity of the radiation emitted at the moment of ignition. There are various types of flame detectors such as UV radiation, IR radiation or visible radiation they detect and respond to radiations to avoid further damage. Flame detectors are available in two categories - detectors in fire alarm systems that detect fire; and scanners for monitoring the condition of a flame in a burner. Flame detectors are being preferred by companies due to their applications in various industries such as manufacturing, oil & gas, and energy & power among others. The report covers both demand- and supply-side analysis of the market. The supply-side market segmentation includes several products and services. On the other hand, the demand-side segmentation includes various industries and regions. This report describes the market trends and challenges pertaining to the global flame detectors market, and forecasts the said market till 2020. It also segments the market on the basis of products, services, industries and geography. It covers the market in North America, Europe, APAC, and RoW (Rest of the World). The report also features a detailed competitive landscape along with profiling of key players in the flame detectors market, an in-depth market share analysis, and market share rankings. It also covers drivers, restraints, opportunities, and the current scenario in the market. The global flame detectors market is expected to grow at a CAGR of 6.07% between 2015 and 2020. In the global market, the manufacturing sector has a large application accounting for the largest share, followed by oil & gas, energy & power, and mining. In the product segmentation, single UV led the global market due to its additional features and capabilities over the rest of the products. On the basis of geography, North America is the market leader, followed by APAC and Europe.